The AsiaN, a Seoul-based online media service published in four languages, aims at playing the role of “the window of Asia” by delivering news in the region from an Asian perspective, its head said. 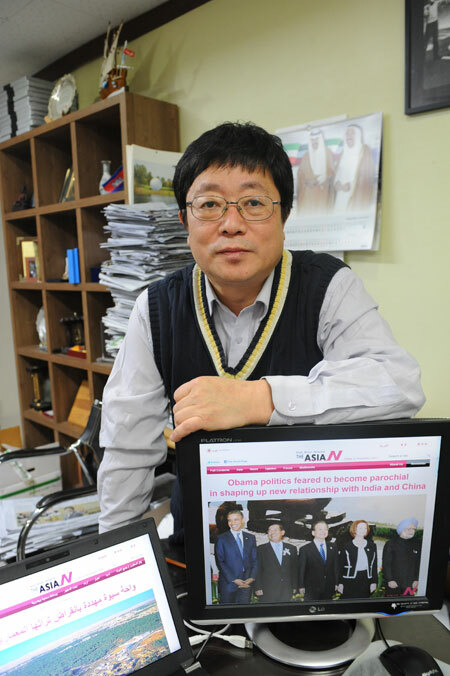 Lee Sang-ki, publisher of The AsiaN (http://www.theasian.asia), said foreign press tend to report Asian news from their own angle and sometimes fail to reflect Asia properly. “For example, I visited Kuwait in October when Emir Sheikh Sabah al-Ahmad al-Sabah dissolved parliament. Many foreign media including AP reported it with a skeptical view because it’s not acceptable in their democratic society,” Lee said during an interview. AsiaN, composed of 150 reporters from 50 Asian countries which are members of the Asia Journalists Association (AJA), provides news in Korean, English, Chinese and Arabic. Lee said AsiaN’s primary goal was delivering Asian news without any distortion or prejudice. The media serially publishes poetry by Souad Mohammed Al Sabah, a Kuwaiti woman poet, in an attempt to fulfill such a task. Among Koreans, former Prime Minister Chung Woon-chan, and Hong Myung-bo, the former Korean Olympic football team manager, are among contributors of columns. Lee said the pursuit of news from an Asian perspective does not necessarily mean it would be anti-America or anti-Europe. However, he took note of the ongoing shift of power from Europe and America to Asia. When asked about the most memorable moment while running The AsiaN for nearly a year since its establishment in Nov. 11 last year, Lee recalled the day when the late North Korean leader Kim Jong-il died. “Thanks to our reporters, we were able to quickly collect a variety of responses from many Asian countries. The article was well received among our readers in 150 countries,” Lee said.